Our Royal Jelly is the freshest available. It's a 3 to 1 concentrate. Royal Jelly is a very rich source of proteins and contains eight essential amino acids, important fatty acids, sugars, sterols and phosphorous compounds. 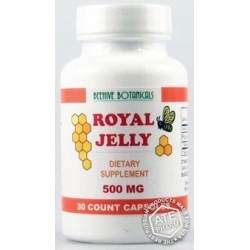 Royal jelly is high in the B vitamin pantothenic acid, recognized for its ability to reduce stress levels. It also supplies the minerals, calcium, copper, iron, phosphorous, potassium, silicon and sulfur. Although royal jelly has been traditionally known to prolong youthfulness and improve the skin beauty, evidence indicates that this substance increases energy, alleviates anxiety, sleeplessness, moodiness, memory loss, and bolsters the immune system. Collagen contained in royal jelly keeps the skin looking smooth and youthful.